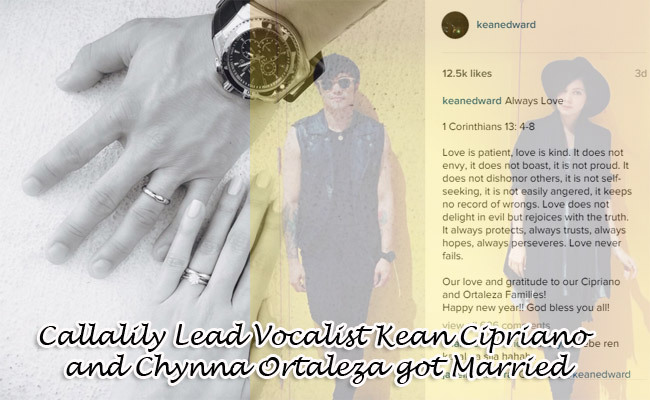 As a silent confirmation, Chynna Ortaleza also used Kean's family name on Instagram. According to Inquirer, Kean and Chynna tied the knot weeks before 2016 in a civil wedding but as of now, there were no confirmations yet if there will be a church wedding. Even so, their fans and supporters expressed their surprise and shock about the sudden news but were all happy for the newlywed. Some even commented congratulatory messages and wished them the best. Always Love 1 Corinthians 13: 4-8 Love is patient, love is kind. It does not envy, it does not boast, it is not proud. It does not dishonor others, it is not self-seeking, it is not easily angered, it keeps no record of wrongs. Love does not delight in evil but rejoices with the truth. It always protects, always trusts, always hopes, always perseveres. Love never fails. Our love and gratitude to our Cipriano and Ortaleza Families! Happy new year!! God bless you all! It was only October when Kean confirmed in an interview on 'Tonight with Boy Abunda', a late-night show hosted by Boy Abunda, that he's in relationship with the actress. He was also interviewed on the same show earlier of December last year with Sam Concepcion to promote 'Your Face Sounds Familiar' finals and was asked if he already proposed to Chynna but the vocalist refuted all of it, and even said that he was enjoying to be with his partner for the meantime. The couple developed their relationship when they did an episode for the drama anthology, Wagas, in GMA News TV. From then on, Kean and Chynna became bestfriends which turned into something more beautiful. Congratulations Mr. and Mrs. Cipriano from CEnterTechNews team!